Let's warm up our Express skills with the most straightforward of servers. We will first look at how to set up a new repo for our app, get Express installed, and finally create and serve up a jaw-dropping "Hello, World" page. First, let's make a new directory and use npm init to create our package.json file. // This creates our package.json file. Next, we will use npm to install Express. Now that we have Express installed, let's build the actual—very basic—application. Now, open this file in your favorite text editor. It does not take very much code at all to get a basic Express application wired up. The following code—ripped directly from the Express docs with only minor branding adjustments—is all you need. // This function is run when the app starts up. The express function is first required using the magic of Node, and then calling it creates an application object which we store as the app constant. Let's alter our program such that it greets a name encoded in the URL. So if we visit "/names/Odin", we should see "Hello Odin!" 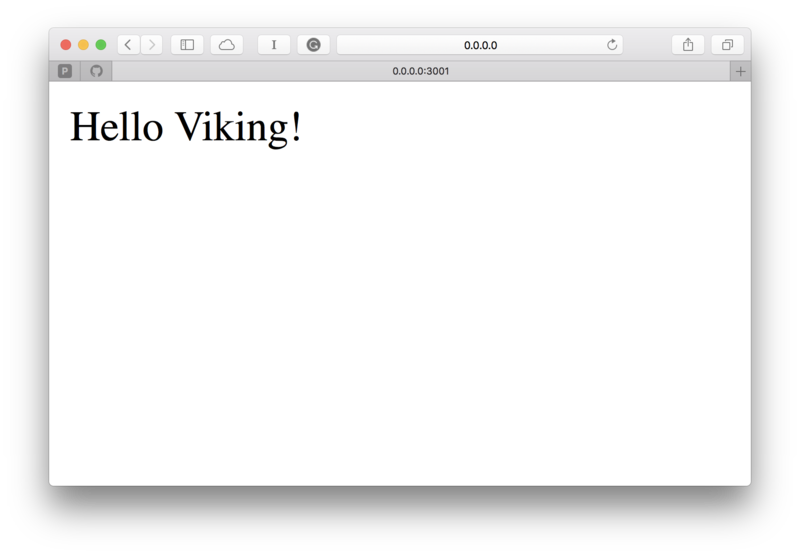 displayed in the browser. As you can see, the :name Route Parameter was automatically added to the params object under the given key. We then simply interpolate this value into our response (here using ES6's string interpolation). With Express, you can create a simple web server in less than 10 lines of code—of course, we could make this even shorter if we were willing to sacrifice readability. Although this application is incredibly simple, it does exhibit the properties shared by nearly every web application. Most importantly, it responds to a request with dynamically generated data.